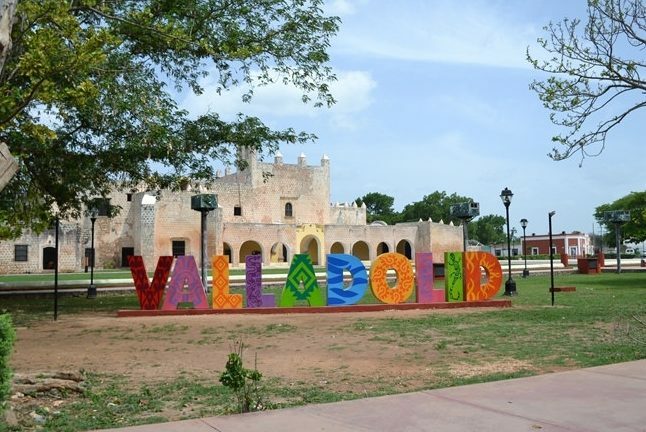 Valladolid in Yucatan state, Mexico is located in the middle of the Yucatan Peninsula. Recognised as one of Mexico’s 111 Pueblo Magicos or Magical Towns, it’s steeped in Mayan and Colonial Spanish History and quite rightly deserves it’s ‘Pueblo Magico’ title. 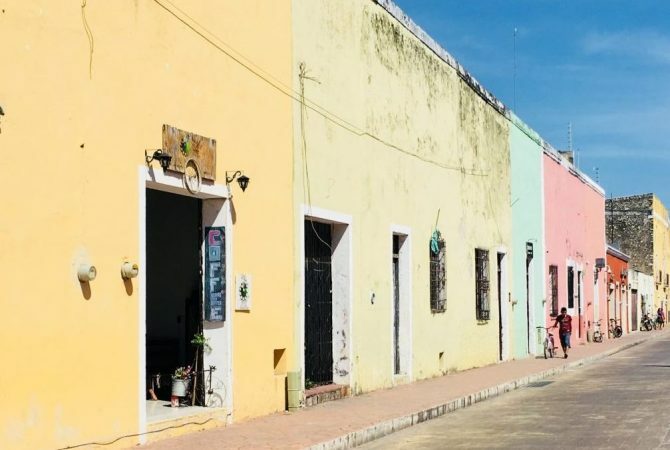 Despite this Valladolid is often overlooked by travellers, many of whom tend to just pass through en-route to other popular Yucatan tourist attractions such as Chitzen Itza, and the Pink Lakes at Las Coloradas. We’re suckers for somewhere a bit less-visited, so a couple of days in Valladolid on our way from Isla Holbox to Merida, just had to be done. Unfortunately, due to boat and bus times we only ended up with about 36 hours in Valladolid. Nonetheless, we managed to make the most of the little time we had; so here are our suggestions on how to spend (about) 36 hours in Valladolid. Photo Credit: flickr photo by A Couple for the Road shared under a Creative Commons (BY) license. If you plan to spend a couple of nights in Valladolid rather than a quick stop as part of a day tour from elsewhere, it’s likely you won’t arrive until late afternoon or early evening. We arrived at about 7:30 pm (or so we thought) on the bus from Chiquila, the port that serves Isla Holbox. 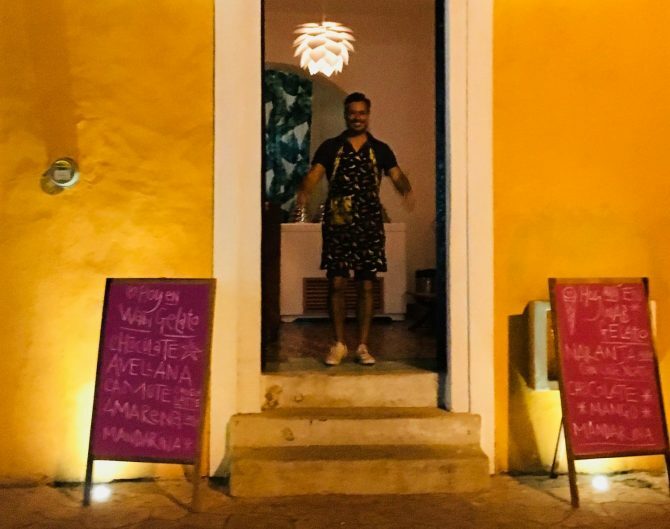 You’ll notice I said ‘or as we thought’, that’s because you need to be aware that when arriving in Valladolid from Quintana Roo state there’s a time difference. Slightly odd is that Yucatan is one hour behind Quintana Roo. Don’t be like us and only realise this the morning after a very confusing evening. Depending on your time of arrival, you’ll hopefully have some time to chill out a bit before getting ready to head out for the evening. After some downtime, it’s time for an evening meal and some entertainment. 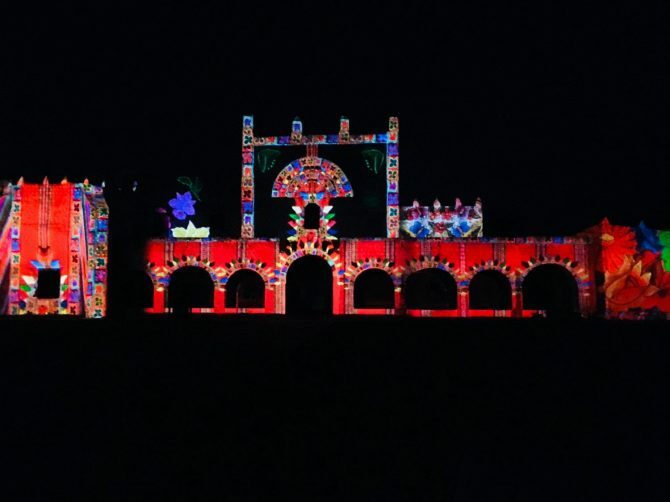 If you’re in Valladolid any night Wednesday to Sunday, make sure you don’t miss the revered historical sound and light show at the Convento de Bernadino. First wander down Calzada de Los Frailes towards Convento de Bernadino, stopping for dinner on the way. We (thought we) were running late so picked the first restaurant we saw that was in our budget near the Convent. Unfortunately, the food was uninspiring and I can’t remember the restaurant name. In hindsight, we should have splurged at the nearby Taberna de Los Frailes which comes recommended. There are two sittings for the sound and light show, a Spanish version at 9 pm and an English version at 9:25 pm. We perched on a wall opposite the large convent and waited and waited for the show to start, beginning to suspect technical issues. Just as I realised we hadn’t heard the 9 pm Spanish version from the restaurant, the lights went out and the show started…in Spanish. Of course, as I mentioned earlier, and as we found out the next day this was due to the time difference, not because the organisers were late starting! We only stuck around for the Spanish version and despite only understanding snippets of what was being said, it was a spectacular, clever show. The colourful visuals projected on the facade of the convent along with the audio, tell stories Valladolid’s lively history. During the day (9 am to 7 pm) on Monday to Saturdays, you can also look around the convent for a 30 pesos (£1.12 GBP) entry fee. After the show, walk or taxi back to your hotel for a good nights sleep. You’ll need an early start next day if you want to fit in as much as possible. Get up bright and breezy and have a good breakfast to prepare yourself for a busy day. Make the most of your only full day in Valladolid with a nice mix of local life, culture and sightseeing. A great way to get a real insight into everyday local life is with an early morning trip to Valladolid’s local market ‘Mercardo Municipal’ and shops. We were lucky enough to be invited to accompany the owner of our guesthouse to these on his daily grocery shop. You could easily do this by yourself though! 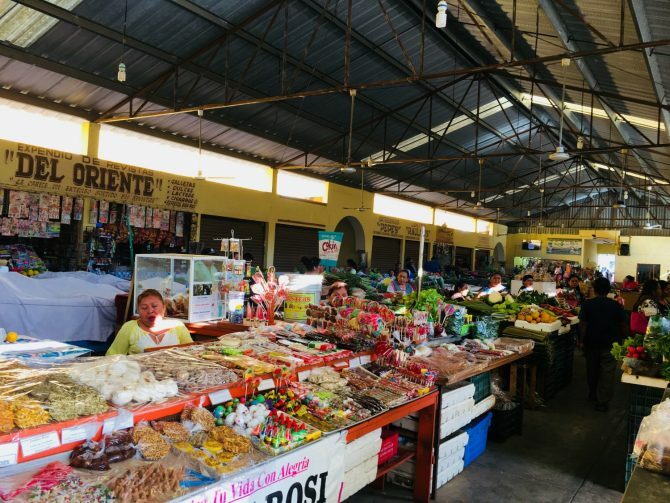 The bustling, colourful market was the most authentic we saw during our time in Mexico. Many of the vendors still dress in traditional Mayan clothes, the women in white costumes with bright coloured embroidery. Take a browse of the stalls full of local produce including fruit, vegetables, homewares, and local soft drinks ‘aguas frescas’. There’s also a meat section which was one of the most sterile we’ve seen in markets on our travels. This won’t be for everyone though as there were animal parts everywhere, with little left to the imagination, so you may prefer to skip it. I especially enjoyed looking at a section full of stalls selling traditional sweets and desserts. Most vendors won’t mind you taking photos, but be sure to ask first as there are a couple of families who don’t like it. Once you’ve finished in the market go across the road to look in a couple of very traditional local shops. Amongst others, there’s a tortelleria selling tortilla dough and ready-made tortillas. There’s also a cheese shop selling a selection of fresh Mexican cheeses. Depending on how you’re doing for time, you could also have a quick look round a local supermarket like we did. Andy has a bit of an obsession with foreign supermarkets so was in his element. Seriously, I’ve lost count of the number of Mexican supermarkets he’s dragged me around! As he rightly says though, along with markets, supermarkets help give you a better understanding of the local life of the place you’re visiting! At 10:00 am head over to Casa de Los Venados (House of the Deer). 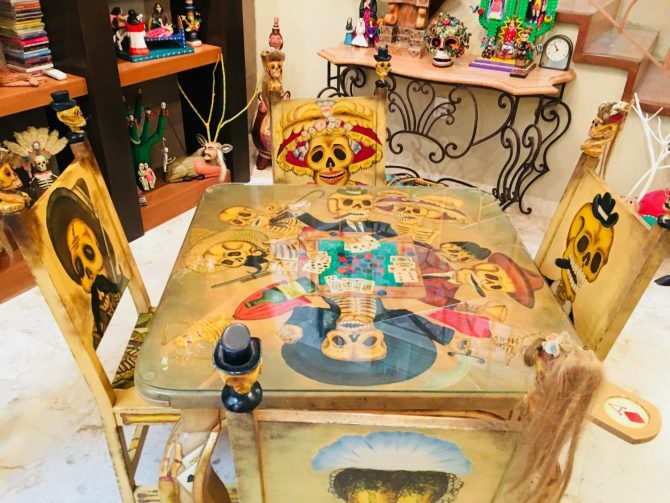 With its very own coat-of-arms, this private home in the centre of town (Calle 40, off 41st Avenue) houses an amazing collection of Mexican folk art. It opens to the public once a day for guided tours and whilst there is no entrance fee, there is a suggested 100 peso (£3.74 GBP) donation which all goes to charity. The collection is such a spectacle to behold, it would take weeks to look at and admire every piece. The owner John and guide David were clearly passionate and knowledgeable about the collection; it was a fantastic tour. Andy and I aren’t art enthusiasts but we do like unusual, weird and wonderful things, curiosities and oddities. Casa de Los Venados has plenty of those; my favourite piece had to be the card table. This is a ‘must-visit’ when in Valladolid. Even though it’s not being an official tourist attraction it’s made its way to the number one spot in Trip Advisor for ‘Things to do in Valladolid’. Once you’ve been wowed by Casa de Los Venados move on to the Palacio Municipal. 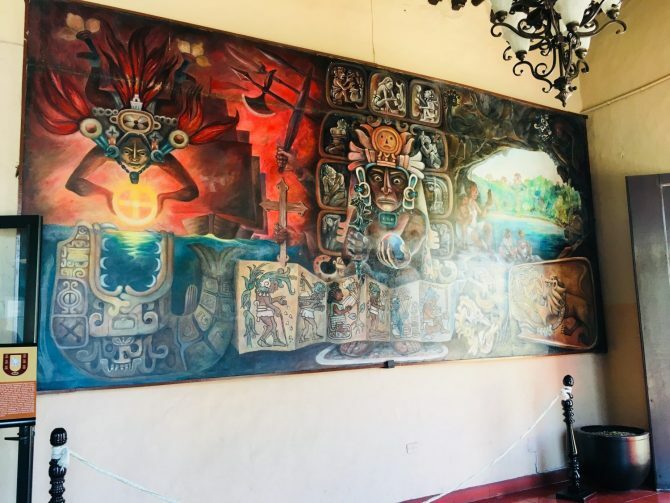 Here you’ll find a second-floor collection of historic murals depicting Valladolid’s history from the Caste War to the Mexican Revolution. You don’t need much time here but it’s a free attraction and definitely worth a look. The gallery also has open balconies which offer a lovely view over the main square. With a bit more time to kill before lunch, wander around the main square or Plaza Principal and the streets leading away from it. It’s also known as Francisco Canton Rosado Parque. 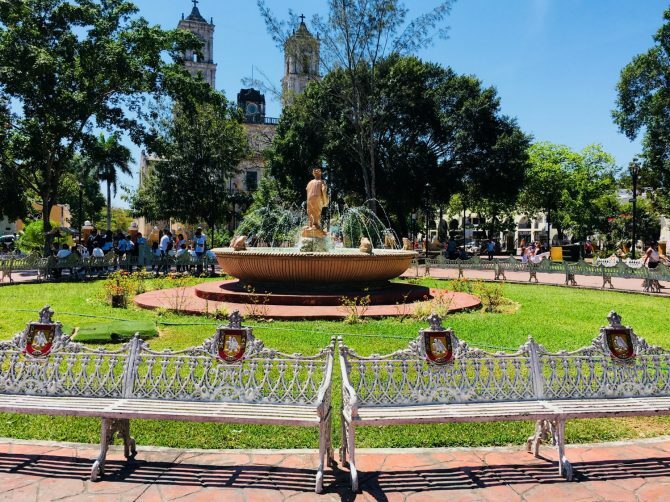 The streets lined with colourful colonial buildings and the pretty plaza with its white benches, love-seats and a big central fountain make for great photo opportunities. The most well-known historic street in Valladolid is the beautiful Calzada de Los Frailes. This fully restored colonial, cobbled street leads from Plaza Principal down to towards Convento de San Bernadino. Down each side are brightly coloured colonial buildings, restaurants and quirky shops with colourful, decorative facades. One shop not to miss is Fabrica de Chocolate Artesanal Maya Chocol Haa which sells traditional Mayan chocolate in different flavours. 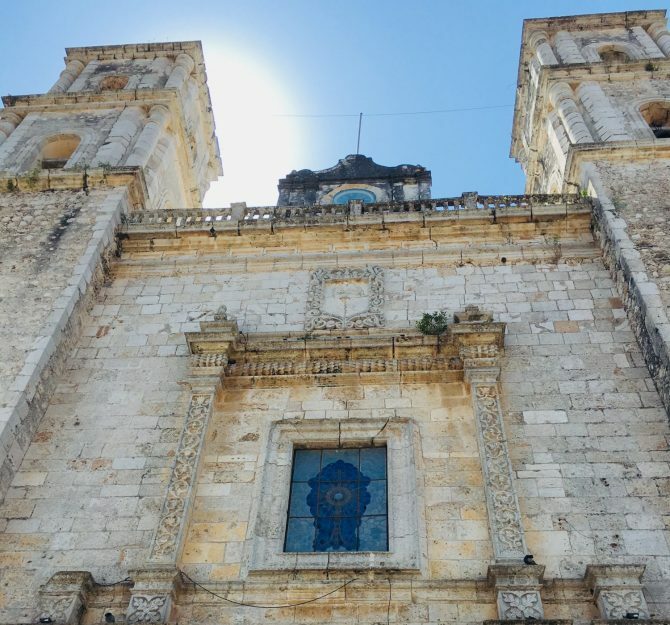 Towering over Plaza Principal is San Servacio Cathedral, built in 1543 from the stones of a Mayan temple. It’s not as ornate as many cathedrals but beautiful in its simplicity nonetheless. You only need about 15 minutes or so to look around the inside. Sunday mass was underway when we went so we stayed outside as we didn’t feel it appropriate to enter. If you do go in make sure you dress appropriately; so nothing revealing, and no hats or sunglasses. At this point, you’re bound to have worked up an appetite and will need to refuel for the rest of the day. In our opinion, the best spot for lunch is in El Bazaar Municipal, an open-air food court on the corner of Plaza Principal. The food court has a good selection of inexpensive local eateries offering a whole range of traditional dishes. 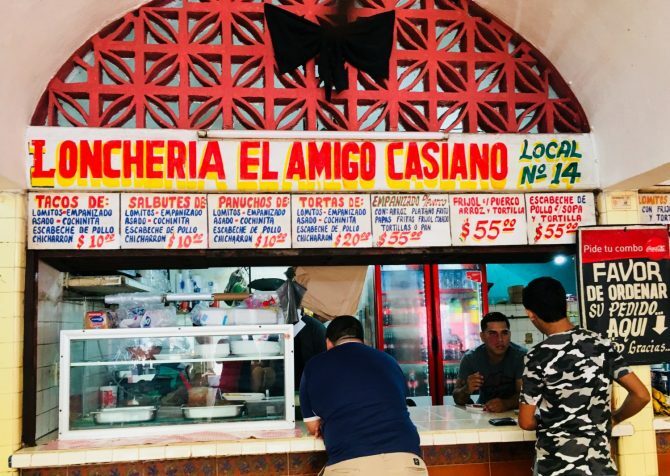 The most popular eatery, recognised by the queue, is Loncheria el Amigo Casiano, near the far left of the food court. 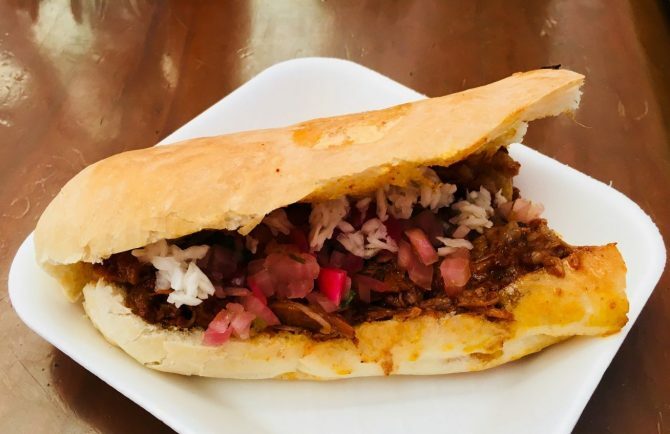 Loncheria’s mouthwatering menu includes many Mexican and Yucatan specialities including tacos, salbutes, sopes, cochinita pibil and poc chuuc. The menu is all in Spanish and very little English is spoken, making this a real authentic Mexican dining experience. You order and pay at the counter, then wait for your meal at one of the picnic tables nearby. Andy and I both opted for a torta de conchinita (suckling pig baguette) for just 20 pesos (£0.75 GBP) and an aguas de pinas (pineapple water) for 15 pesos (£0.56 GBP). Both were delicious bargains; don’t leave Valladolid without eating at Loncheria’s at least once. Hunger sated it’s time to venture outside of Valladolid for several hours sightseeing at Ek Balam ruins and Cenote X’Canche. Located about 25 minutes away from Valladolid the easiest way to get there is by colectivo taxi. These aren’t the mini-bus colectivos we’d used in Quintana Roo, instead, they’re car taxi’s that take up to four passengers. A colectivo to El Balam and X’Chanche (both at the same site) should cost 200 pesos (£7.48 GBP) split between the number of passengers. You can find one on Calle 44, between calles 35 and 37. Drivers also tout for customers on the streets nearby, which is how we found ours. Our driver told us to wait on a bench for a few minutes whilst he went off to find two more passengers. 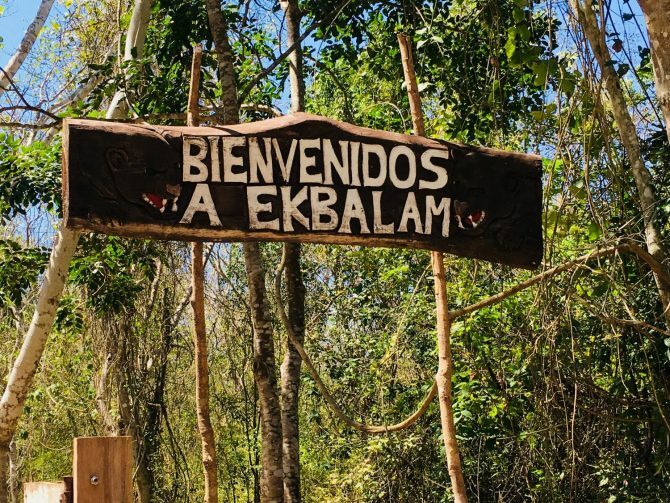 The entrance fee for Ek Balam was 211 pesos (£7.89 GBP) per person plus another 45 pesos (£1.68 GBP) if you wanted to take any video, which Andy did. 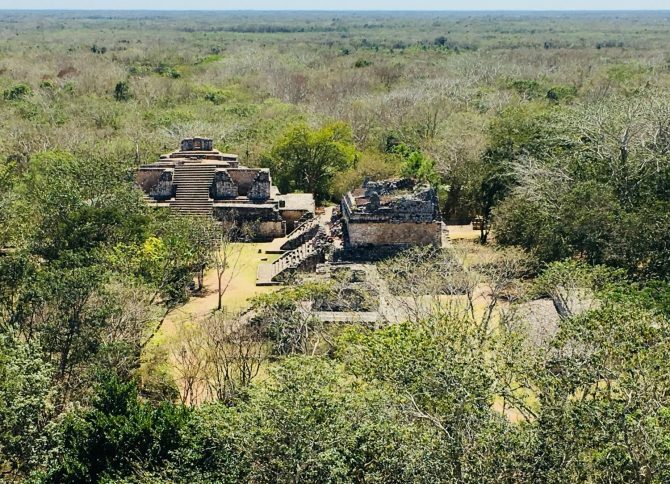 Ek Balam is one of the more off the beaten track ruins and gets significantly fewer visitors than the ruins of Chitzen Itza, Coba and Tulum. In fact, during our visit, we only saw about ten other people. It’s also one of only a few ruins that you’re still able to climb and explore the inside of which makes it even more interesting. Dense jungle surrounds the ruins; you can get a great view of this if you climb to the top of the main pyramid as we did. It only took us about an hour to explore Ek Balam, but we were kind of rushing it as it was an extremely hot day, the hottest day we’d had in Mexico so far. You could take much longer but be sure to take plenty of water, a sunhat and sunscreen with you. Once you’ve had your fill of ruins you could also take a walk via a 1.5-mile jungle trail to the peaceful Cenote X’Canche. 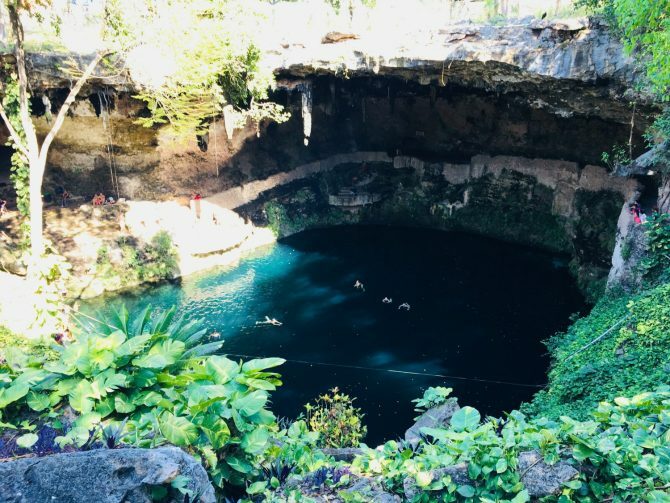 At this natural limestone sinkhole, you can take a refreshing dip to cool off. Sadly we had to skip this as we had other things we still wanted to see back in Valladolid and were running out of time. Head back to the carpark to find a colectivo to return you to Valladolid. If you’re lucky there may be one waiting, otherwise, you may have to be patient. The return journey should be the same price, so you can either pay for the whole car and leave straight away or wait for other people to leave the ruins and share with you. We opted for the latter and had about a half an hour wait in the shade of a palapa. 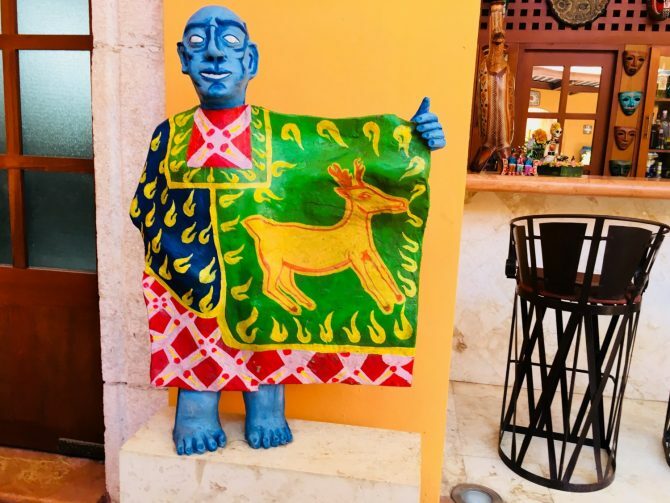 Depending on how long you spend at Ek Balam and Cenote X’Chance, it will likely be late afternoon or early evening when you get back to Valladolid. If it’s the former you may still have time for a quick visit to Cenote Zaci, built on the Mayan settlement ‘Zaci’. This partially open-air cenote is located a few blocks away from the main plaza so is very easy to find. It’s about 25 metres wide and 35 metres long with its greeny-blue waters being a depth of 40 metres at its deepest. The limestone overhang decorated with stalactites, hanging roots and vines offers some shade, at least for part of the day. 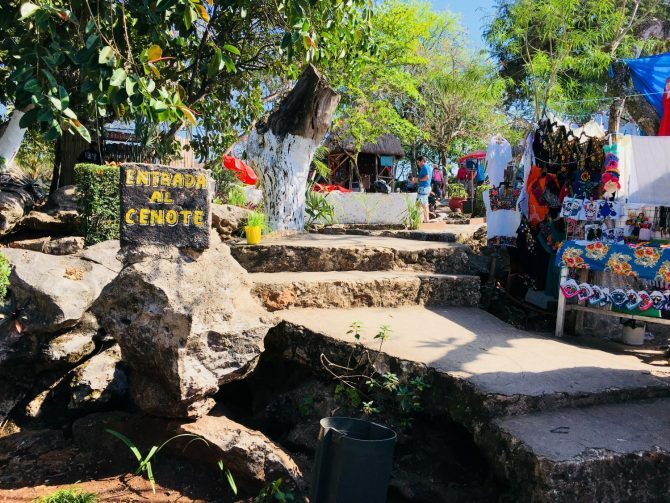 Access to Cenote Zaci is via a stone staircase leading through a tunnel and the entry fee is just 30 pesos (£1.12 GBP). When we arrived we realised we’d forgotten our swim stuff so decided to give it a miss. We were still able to view the cenote though by sneaking in through the adjacent restaurant onto the viewing platform. 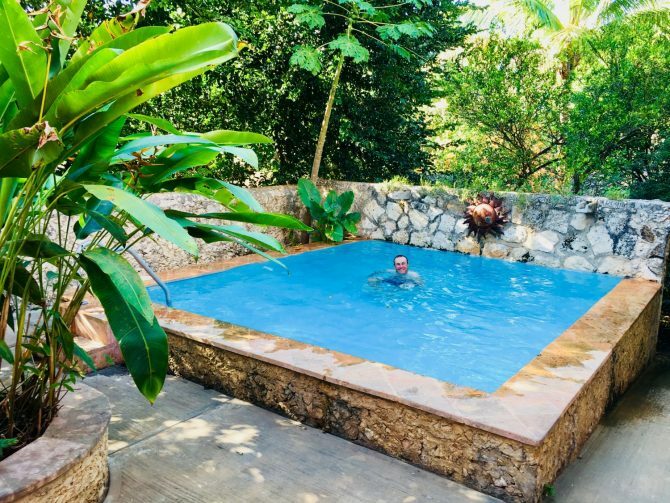 Luckily we didn’t mind that we didn’t get to take a dip as we’d been already been spoilt by our earlier visit to the Choo Ha Cenote with Layla Guesthouse in Puerto Morelos. Although Cenote Zaci looked quite safe for swimming I’d still recommend wearing a life-jacket. You should also wash off any insect repellant and sunscreen before you go in as it can damage the eco-system. If it’s a sunny day you can always use an eco-friendly, biodegradable sunscreen. After an hour or so rest and relaxation back at your hotel or guesthouse it’s time to head back out for dinner. If like us you enjoy sampling ALL the local dishes I’d recommend you try out Restaurant Oasis Familiar. It’s kind of a cross between a restaurant and a cantina and comes recommended by the locals. If like us you’re always on the look-out for real, authentic, local food then you can’t go wrong here. The menu is full of reasonably priced traditional Mexican and Yucatan dishes. They also serve beer and soft drinks, including huge freshly-made fruit juices which looked amazing. 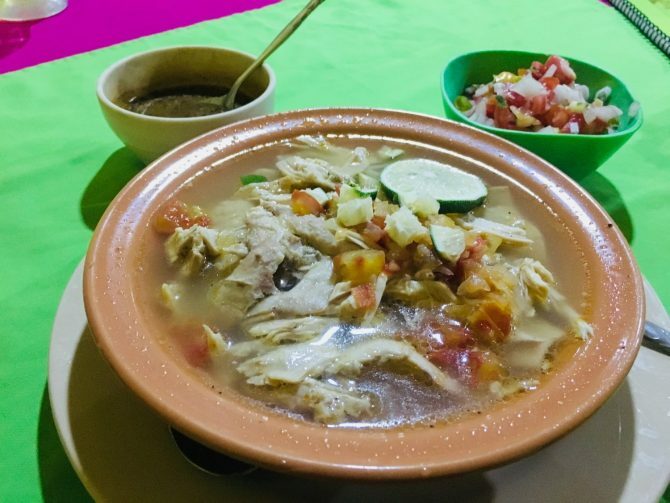 For dinner, I had the Yucatan speciality sopa de lima, a chicken and lime soup with crispy tortilla strips which cost me just 65 pesos (£2.43). It may sound simple (and a little strange), but I can assure you it was delicious. The fresh, citrusy, aromatic flavours work amazingly together. Andy opted for fajitas combinados, similar to those we cook in the UK, except made with several types of meat and served with rice and beans. It was a huge portion and I think it was meant for two people, even so, it still only cost 110 pesos (£4.12). As is the norm in most local Mexican restaurants our food also came with a massive pile of tortillas. Photo Credit: flickr photo by Adach Photo shared under a Creative Commons (BY-SA) license. After dinner, you’ll definitely feel the need to walk off all that food so take a stroll back to the main Plaza to see it by night in a different light. 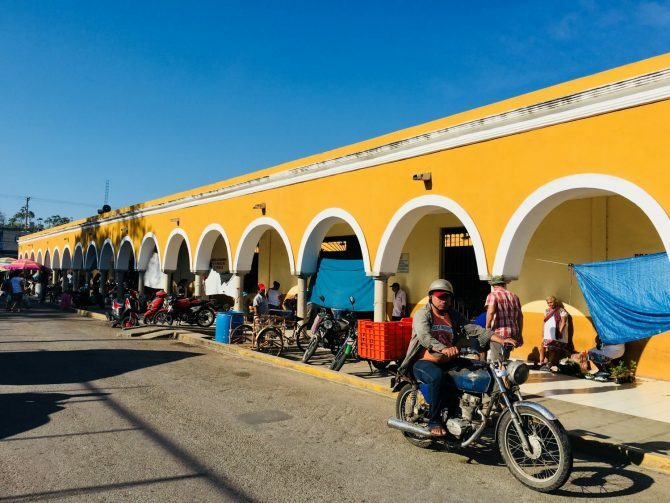 You’ll find in the majority of Mexican towns and cities that as the day draws to a close and the sun sets, locals flock to the main plazas to walk and socialise with friends and family. 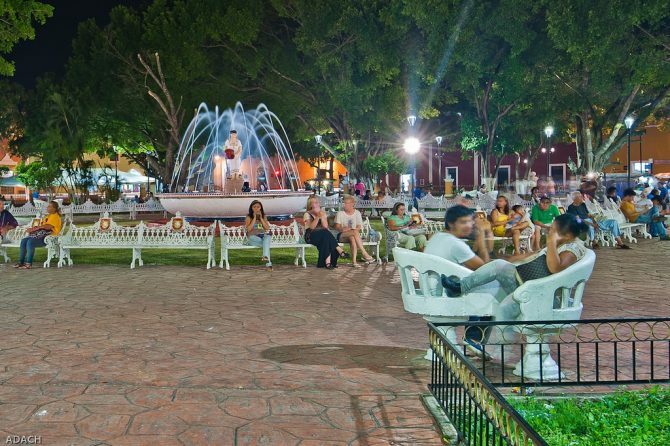 Valladolid is no different, by night Plaza Principal buzzes with locals enjoying their evening. We were there on a Friday night which I think was probably busier than a weeknight but from past experience, I expect it would still be fairly busy any night of the week. Of an evening (especially on the weekend), you may also find street food stalls, and street performers and musicians to entertain you. If you have a sweet-tooth you have to sample another local delicacy – mamey ice cream. Mamey is a fruit with bright orange flesh, said to have a unique taste – creamy and sweet with a complex mix of flavours including almond, pumpkin, and peach. It seems everyone interprets its flavour differently so I was desperate to try it for myself. I’d heard the ice-cream palour Wabi Gelato was THE place to try mamey ice cream, so we spent ages during our after-dinner stroll trying to find it. We were completely unsuccessful and in the end, we gave up. All was not lost though and later, as we wandered around we stumbled upon the quaint little ice cream palour on Calle 41. So I did get to try mamey ice cream after all. It was 35 pesos (£1.31) a scoop and was definitely unique. It was quite tasty but I couldn’t put my finger on exactly what the flavour was like. You’ll just have to try it yourself. 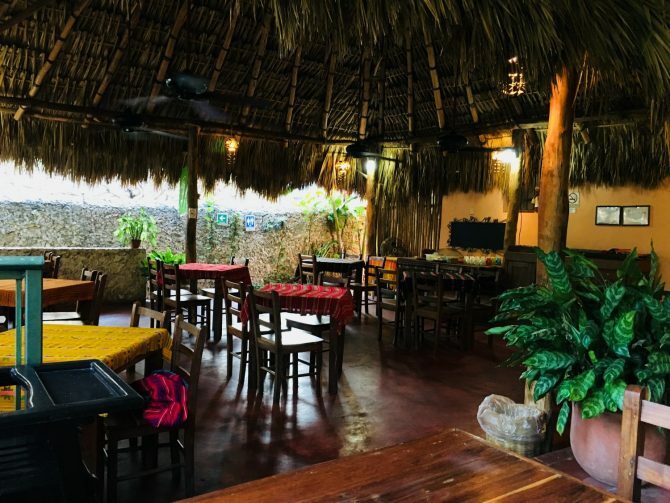 You may like to finish your evening off with a drink or two in a traditional Mexican cantina. This was our plan and we’d heard about a lively traditional Mexican cantina, complete with swinging doors called Cantina Joyita. We like trying out local drinking establishments and especially enjoy a beer or two on a Friday night (Engish tradition), so we were disappointed to find Joyita closed that night. It was recommended to us by several people though so if you do pop in there for a drink, or have been there already, we’d love to hear how it was. We were hosted for two nights in Valladolid by Casa Hamaca Guesthouse. Read more in our full Product Review Disclosure. 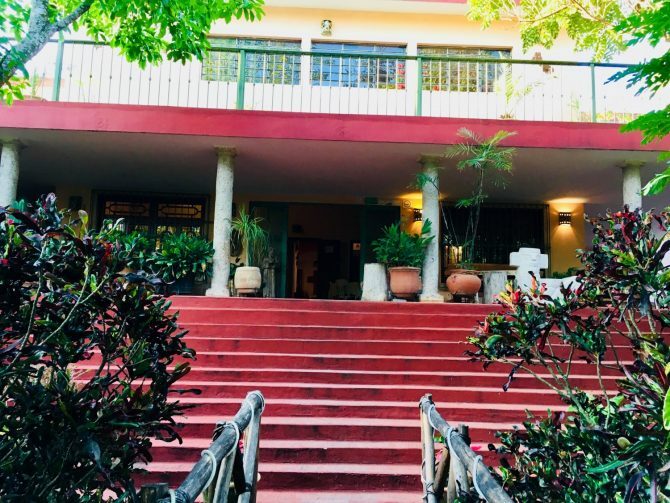 Located on the corner of the quiet Parque San Juan within walking distance of the bus station and the main plaza is Casa Hamaca Guesthouse. To reach this beautiful restored Mexican Hacienda you first walk along a wooden pathway through tropical gardens full of swaying palms, leafy tropical plants, flowers and birds. 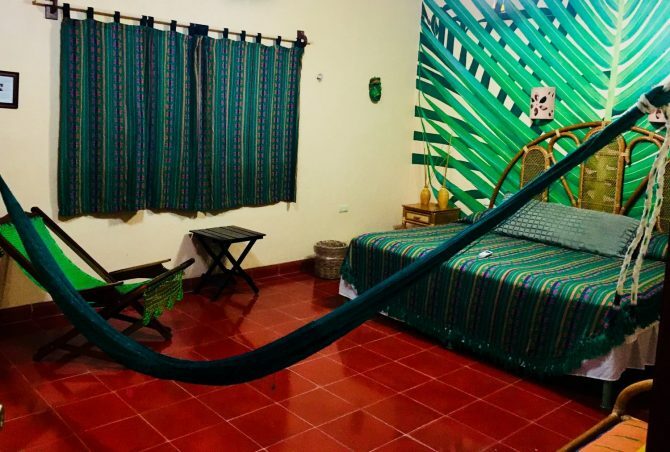 Casa Hamaca has a selection of rooms: twin and king rooms (sleeping two), triple rooms and queen rooms with two queen beds (sleeping four) (two queen beds). These range in price from $80 USD (£59.96) to $150 USD (£112.43). When we arrived we were greeted warmly by the owner Denis Larsen who has lovingly restored the hacienda to create the guesthouse it is today. He prides himself on offering a welcoming home from home for his guests; as he says ‘mi casa is su casa’ (‘my home is your home’). We had a quick chat with him and were invited to join him on his daily trip to the local market next morning which we readily accepted. He then introduced us to a member of staff who showed us to our room and gave as all the information we could possibly need for our stay. Each room at Casa Hamaca is tastefully decorated with its own theme; each is a work of art in its own right. We stayed in ‘Tree Suite Che Na’, one of the air-conditioned King Suites on the ground floor, leading to the central lounge area. Much to my delight, the decor had an emphasis on the colour green – my favourite colour. I loved the amazing leafy mural at the head of our huge comfy bed. In the room was everything we needed for a comfortable stay: a bamboo sofa, green soft furnishings, a deck chair, a bamboo sofa and best of all a green hammock – perfect for nap after a busy day sightseeing. If you like to unpack, the room also has a wardrobe and bedside tables so there’s plenty of room for your belongings. Adjoining the bedroom was a big en-suite shower room. It had a good shower, toilet, huge washbasin unit with complimentary toiletries and plenty of fluffy white towels. Breakfast, included in our room rate, was served in Restaurant XocoLoco set under a palapa that extended out from the main house. You could either eat there or out on the veranda overlooking the gardens. For guests, breakfast consists of a continental style buffet of fruit, cereal, yoghurt and cakes, one breakfast item off the menu, plus juice and tea or coffee. The first morning we both opted for Huevos (eggs) Casa Hamaca and the second morning, a delicious omelette. Sitting under the palapa enjoying your breakfast, listening to the birds and watching squirrels scurrying in the trees was the perfect start to our days in Valladolid. Non-guests can also drop by and order breakfast from the menu. Restaurant XocoLoco also serves lunch and dinner to both guests of Casa Hamaca and to the public. The menu has a wide range of Mexican and Western dishes and a good drinks menu. Denis visits the local market himself every morning to do the guesthouse’s grocery shopping so you can be sure your meals will be prepared with the freshest ingredients. Sadly, we didn’t get chance to eat any other meals in their restaurant as we were too busy trying to see everything. To the left of the veranda at the side of the guesthouse was a lovely, refreshing plunge pool. I didn’t get the chance to go in it as I was busy making use of the wifi to catch up on the work. Andy, on the other hand, made sure he spent a little while flailing around in the pool each day. We loved our short but very sweet stay at Casa Hamaca. I think what especially makes it so special was the friendliness and kindness of its owner Denis. He made us feel completely welcome from the second we arrived. We liked that he employs Mayan staff and that some proceeds go towards helping local communities. He has also built an English school and library. Casa Hamaca Guesthouse is the perfect relaxing base for a couple of nights (or more) whilst you explore all that Valladolid has to offer. Andy has also made a vlog on our stay at Casa Hamaca Guesthouse. If you need accommodation more suited to a different budget or travel style there are lots of other accommodatin options in Valladolid. 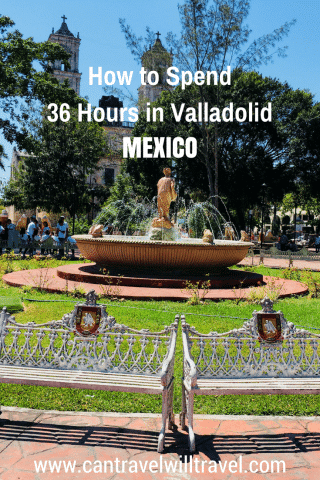 So those are our suggestions for how to spend 36 hours in Valladolid. Of course, there are several other things you could choose to see and do depending on your preferences and time restrictions. For example, there are lots of other cenotes around Valladolid and Merida or the famous ruins of Coba or Chitzen Itza. Have you been to Valladolid? Can you recommend anything else I may have missed? I enjoyed reading the comments on Valladolid since I lived there for sometime. 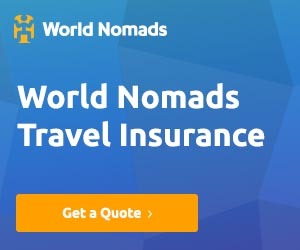 Having lived there, many of the choices are much different than I would like as far as where to eat and what to see but all opinions are interesting. First I would mention that night is never a good time to go to a Cantina since they are popular afternoon spots. By law, a cantina cannot be open late at night. Valladolid does have some good eating establishments and it’s a shame you had no chance to try them. I wouldn’t go to the area mentioned with the food stalls at the corner of the Plaza which is one place I do avoid. I was warned when first moving there but went anyway and have to say one of the few places where I have gotten sick in Mexico. As far as accommodations for overnight visitors, Valladolid has so many it is difficult to choose. I do try to frequent the locally owned hotels and my favorite has long been the Hotel Zaci. Located just halfway between the bus terminal in the main Square, it has nice grounds and all the amenities for a very reasonable price. I do recommend the visit to Valladolid, it has something for everyone. Thank you so much for your comments, it’s always helpful to hear the thoughts of someone who has lived in a place for a while. We said ourselves Valladolid is definitely somewhere we could live. love to give our readers some additional information from someone that’s spent more time in Valladolid. where do i find the flamingos on the side of the road.. i remember driving and seeing flamingos to buy but didn’t stop.. I am going in July and want to buy a few. That’s a very good question, I didn’t see any flamingoes at the side of the road when we travelled to or from Valladolid – sorry! I’m sure there’ll still be there somewhere. I may well have dozed off on the buses and missed them as it was a pretty busy few days!